A reproduction of the original book about the school and related business established by Annie Malone in St. Louis. Originally titled "Poro In Pictures" it is a photographic tour of the groundbreaking institute. 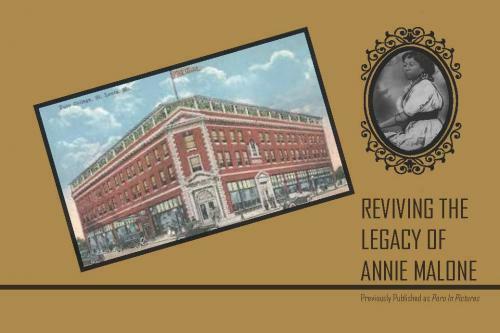 Sales of the book go to the benefit and support of the Annie Malone Historical Society and it's forthcoming museum celebrating a pioneering African American entrepreneur, charitable organizer, and civil rights advocate. Annie Malone was also the first African American woman millionaire in the United States. Linda M. Nance formerly served as the Director of Resource Development for the Annie Malone Children & Family Service Center in St. Louis, Missouri. In that capacity, she annually coordinated activities involving five different fundraising events (the culminating event being the Annual May Day Parade - the oldest and second largest African American parade celebration in the country), opened two cafes, secured authorization to raise funds to leverage Neighborhood Assistance Tax Credits, and successfully conducted a Challenge Grant campaign for the agency. She continues to be passionate about her interest in sharing with the City of St. Louis, the State of Missouri and the world, the commitment, drive and generosity that is the legacy of Annie M. Tunbo Pope Malone. Prior to starting her career in fundraising, Linda completed an internship with the Federal Bureau of Prisons working as a Corrections Officer at the Robert Kennedy Youth Center in Morgantown, West Virginia. She completed qualifications for Police Officers Training from the Northern Virginia Criminal Justice Academy in Fairfax, Virginia and served six years as a Deputy Sheriff for the Fairfax County Sheriff’s Department. Linda held the rank of Corporal and served as a Jailer, Bailiff, Court Services and Transportation Officer. Linda also served on the Department Crisis Intervention Team responsible for evaluating threat scenarios, conducting training drills and working with hostile inmates. Linda earned a Bachelor Degree in Psychology and a Bachelor Degree in Sociology from Maryville University in St. Louis, Missouri. She holds an Associate in Applied Science Degree (emphases in Human Services/Corrections) from St. Louis Community College at Florissant Valley also in St. Louis, Missouri. A 2009 graduate of the FOCUS St. Louis Leadership program, Linda has also completed the Community Arts Training and the TIGER Fellowship programs sponsored by the St. Louis Regional Arts Commission – intent on impacting social change efforts through the arts. She is a long-time advocate for children/active community participant and has serviced as a member of Citizen for Missouri’s Children, President of the Webster Groves Board of Education, member of the Missouri School Board Association, and as a proud member of the John E. and Regina S. Nance Memorial Scholarship Fund. Linda F. Jones received her Master of Business Administration from Indiana University and has taught Finance and Accounting classes at Indiana Wesleyan in Merrillville, Indiana. She has also taught GED classes at the Gary Community School Corporation in Gary, Indiana. She is a historian with an insatiable interest in researching the history of Blacks, her own family history, and in particular, the history of Annie Turnbo Pope Malone. She writes a monthly newsletter for the Black Owned Beauty Supply Association (BOBSA), has written several articles on the history of Blacks in the United States and has recently been working to pen her own autobiography. Linda is a passionate lecturer helping school-aged children learn the essentials of properly managing personal finances and the importance of saving for the future. She enthusiastically entertains all opportunities to engage and inform interested groups about the life and legacy of Annie Malone.